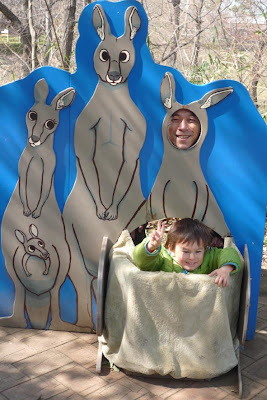 Here are the kanagroo's :o) The Roo's are in an open enclosure so you can actually walk through, no bars between you and them! 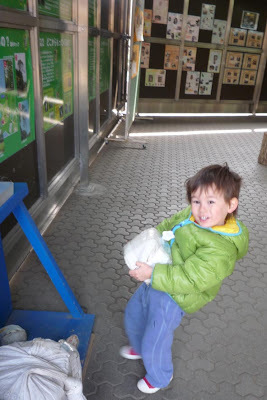 This is in the koala house, there are bags of weights, the one Ebi-kun is holding is the weight of a koala. 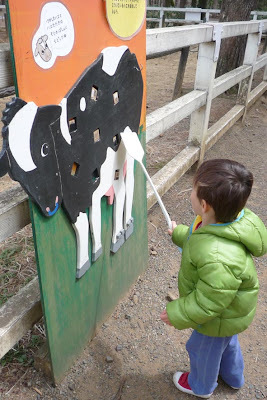 This is in the dairy area, they do milking demo's, we had to drag Ebi-kun off this, it is explaining about the cows tail, the little square on the cow have flies on them and tabs of velcro and you have to use the swatter (tail) to get them off. 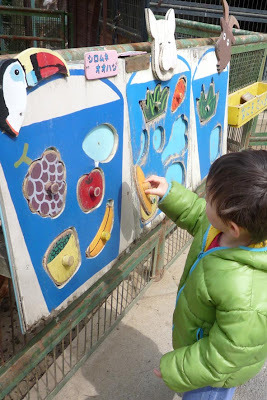 The petting area is quite big and has animals wandering around such as goats, pigs, sheep and ducks and there are puzzles for the kids to do, this one he is sorting which food each animal eats. 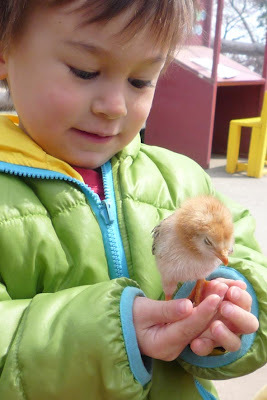 They had chicks to hold this time as well as the usual rabbits and guinea pigs, we also got to stroke an owl, I don't think I have touched an owl before, I was surprised how soft it was. 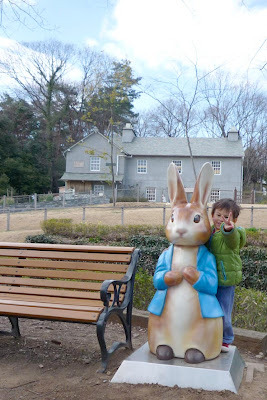 One of the odd things about the zoo is the Peter Rabbit reference library, they have built this house, just like the Peter rabbit one and there is a cute little Peter Rabbit play garden and a shop, I don't get why they have this in the middle of Japan - there again there are a lot of things I don't get about Japan. 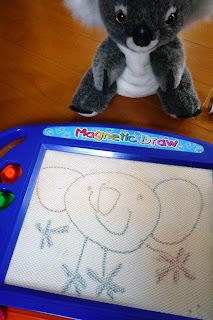 When we got home, Ebi-kun drew this koala! I am uploading the rest of the pictures to Flickr for those who are interested. The zoo also has a kodomo no shiro in case the weather is bad, large areas to picnic, they have a stage and put on a show, an area with dinosaurs, a wading stream for the summer and pony rides for kids over 4. If you need a pushchair you can hire one for the day (handy for pushing the picnic bag around I find!). It is quite hilly but there is a little train that goes round for those with weak legs.